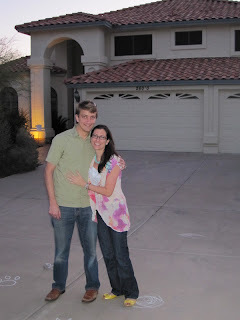 On Friday, everything went through in escrow just in time, with us signing at our rental house at 7am, and the official recording happening just before 5pm (with a few screw-ups from the mortgage company in between, but nothing we couldn't handle). We packed up my car with a first load (mostly of tools for repairs) and enough clothes to camp out in for the very first night as homeowners (which still sounds soooo crazy!). When we got to the house, we had a welcoming committee of two of the neighborhood families. 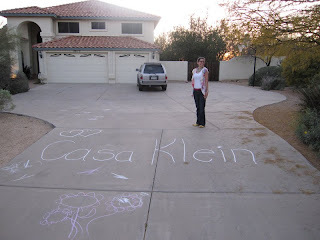 They had chalked the street and our driveway with welcome messages, including a "Welcome Max and Mande, Turn Here" street marking and "Casa Klein" driveway, plus paw prints from Bob the Bobcat, a neighborhood favorite. 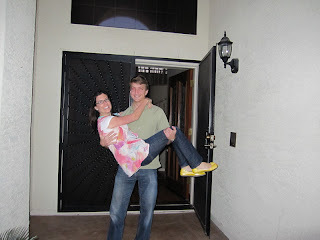 I got to once again carry my bride across the threshold into this next chapter of our lives. We think the missing number adds character, don't you? Congratulations Mande & Max!!! We're so happy for you!! Let us know when you're settled in so we can plan a get together! Love this idea and your execution. This is truly a great read for me. I have bookmarked it and I am looking forward to reading new articles.